So back in the fall I got the idea that I should begin doing reviews on the bikes I'm riding since suddenly there have been many. As I've begun doing this I realize that perhaps a better start would be my bike history. That way, I can link back to this post in the other articles rather than repeating where I'm coming from over and over ad nauseam. So here it goes. To begin with, I've almost always loved bikes. Initially I think it was a combination of the freedom and a bike being the closest thing I could get to a car. You see, I also like cars quite a bit. As I have grown older, I have also realized that biking is a good way to save cars. I'll leave that for another post though. In addition I have cerebral palsy. My feet and my left arm don't quite work right. This has left me with a unique relationship with bikes. For one, physical activity is good for everyone but when things don't work right one needs to take even better care of oneself. Biking seems to be one of the best exercises for my type of Cerebral Palsy. It works the muscles that need to be worked and stretched and puts low impact on my joints which I will probably wear out faster than other people tend to. So biking has always been a really good alternative to walking. It also seems to put me on an even playing field with able-bodied people. I can build the same strength as other people however being on foot for various sports requires a dexterity I can't quite muster. So biking is important to me. It all started with this little Schwinn Aerostar my parents bought me. I rode the heck out of that bike even though I never really went very far. It has a chain guard, a big foam pad that said "Schwinn" on it so I didn't bash my head off the bars, and a coaster brake so I could do super long skids. Over the years I crashed it and bumped it into things etc so it got plenty of scratches etc but it stood up to them. I eventually covered it in stickers from Burger King kid's meals. At one point I had a really cool megaphone mounted to the handlebars. I also used to put cards in the spokes. 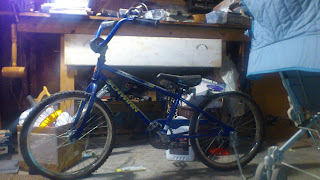 A kid down the street and I used to see how many we could get on there and at one point had cards up and down the back forks and seat stays as well as the front forks. Cause when you're eight more is better. Eventually the seat would go up no further and I had to get a new bike. My understanding was that this bike started a bunch of people into BMX riding as well. I must say, there's no danger of that with me. My CCM echo (lowercase title) was the first bike I bought with my own money and to date the only new bike I've ever bought. It was a piece of absolute junk. Sorry I can't find a picture. When it was new I thought it was a pretty cool looking bike. I was in grade four and managed to save up about $150 which seemed like an awful lot. I was convinced I was buying a pretty serious bike and it was an adult bike. My dad was of the "it doesn't fit unless it's too big for you" school of thought. So I barely rode it for a year or two. In addition it had painted steel rims which I thought was super awesome in the store but after a ride or two made the crappy, crappy, brakes squeal like crazy. They were jarringly loud. Nonetheless I eventually grew into it and rode it till it pretty much fell apart. The brakes were always garbage. Both derailleur eventually disintegrated. The grips disintegrated. The cool paint faded and rusted really fast. Having said that, the summer of Grade 8 I calculate that I rode about 1500 km. I wore the tires nearly bald over the lifetime of the bike, went through a set or two of brake pads, and only gave up on it when a wheel kept popping tubes and my thirteen-year-old brain couldn't figure out how to stop it. I had run out of new tube money and started riding an old ten-speed we had in the house until I got some more. That bike turned out to be a favorite and after leaving the echo alone for only a few months rust ate it and that was that. The bike I picked up was my mother's old Raleigh ten-speed. It was an early eighties vintage with steel rims but some aluminum components. It had good fenders on it and a quite nice rack. My suspicion was that it was a Grand Prix or the Canadian-named equivalent It was a men's bike and she found it uncomfortable so she rarely ended up ever riding it. The result was that I got my first taste of ten-speed bikes on a solid entry-level nearly brand new Raleigh. It fit me just right. It handled beautifully. It felt incredibly fast after my CCM. When I couldn't figure out why the tubes were popping in my CCM I just started riding this bike and never looked back. This was short-lived however. Seeing my enthusiasm for my mother's ten-speed my father urged me to take his old bike. He claimed it was much more serious of a bike and being of the mindset that it doesn't fit until it's too big the extra large frame would fit my 6'3" (tall average) build better. It was enormously uncomfortable and I could never ride it more than two or three kilometers at a time. In addition to that it was pretty worn out and my father at one point had "stripped it down" to make it "faster. "The paint came off in large sheets (though the bare metal never once rusted despite being winter-ridden). Someone (possibly me) had rebuilt the bottom bracket, removing the right fixed cup and not tightening it with the right tool. Without knowing that it needed to be so tight, I was dumfounded as to why the cup would work loose after just a few kilometers. It was quite a frustrating bike for me. I don't know what model it was. It would have been mid-seventies vintage. It had aluminum cotterless-cranks, safety levers, steel bars, and steel rims. It would live three lives due to my father's insistence that it fit me so well and was such a nice bike. The first life was when I simply rode it as-is. I'd ride it a bit around town and back and fourth to school. That was all I could stand. It lived a second life in my undergrad years when I attempted to make it my primary transportation. By this time I had grown a strong hatred for the bike but couldn't justify buying one when I already had one. I rode it around first year, often leaving it unlocked in a bike-theft prone city. Once even for a week. It once got stolen but to my dismay I found it lying on the other side of campus. Perceiving that I was stuck with it, the next summer I rebuilt it and repainted it. Aside from creating enthusiasm for riding it, this didn't help the bike one bit. Despite leaving it lying around everywhere it never got stolen. The third life of the centurion was short and came after undergrad and into my first year of my M.Div. When I arrived home after my degree I was bound and bet I would get back into biking. Unfortunately my biking enthusiasm had worn thin and I had given up on biking on the inside. It required a complete rebuild after living three hard years in Waterloo in residence common rooms and snowbanks. I began rebuilding it. I got as far as disassembling and cleaning everything and buying new tape and tires. After that I simply lost interest. The bike sat in the garage half assembled for a while. When I had finished my first year of my M.Div. and was facing a summer in Toronto I realized that I needed a bike. I had also discovered Sheldon Brown's website. This time I was determined to make the bike work. I had the right information and a need. I moved the bike (half assembled) to Toronto and left it in the basement of my residence. Now, I did not lock it. This was not because I wanted it stolen this time. Quite the opposite, I didn't have money for a new bike despite wanting one and having looked at some. This was because I didn't have a lock anymore and lived in a seminary. Things shouldn't go missing from a seminary. In addition there were nicer bikes than mine unlocked down there which had been unlocked for quite some time. Lastly, it was unrideable. There was no chain. The tires were flat. There was no grip tape. There were no cables on the brakes. The bearings had been cleaned but hastily thrown together without grease or adjustment when I ran out of time at home and had to bring the bike to school in one piece. It was utterly unrideable. Yet when I went down to put it back together, it was gone. This is when I bought the Superbe. It rekindled my interest in bikes. This picture is from the first day I bought it. Turns out I don't have a good picture of it as it sits today. I have never liked derailleurs but never realized there was an alternative. I just always found them too finicky and never had need for the number of gears they provide. Having found Sheldon's site I had read his page on English Three Speeds I had become convinced of how great old three-speeds were for commuting. At this time in my life I was not looking for a toy but legitimate transportation. Their chain guard and fenders would allow me to travel in nice clothing should I need to. Their three speed hub allowed for nearly maintenance free operation and shifting while stopped which was incredibly useful in stop and go traffic. Their sturdy racks would take a heavy load. Their older appearance and heavy but simple construction meant that they could stand up to the abuse of student utility riding. On top of that, an old three speed had the same appeal as an interesting or vintage car. Having said that, English Three-Speeds were and are enjoying a surge in popularity and so had been commanding prices in Toronto of more than their brand new counterparts. I had been eyeing up a KHS Green at a local bike shop but at the time was dirt poor and knew little about bike value. I just couldn't justify it. Luckily I am a Kijiji lurker and one day I happened to be at home in Belleville and a really good Superbe came up for next to nothing that I snapped right up. I won't get into the details here as it will have it's own post once I get some better pictures of it. This has been my trusty steed for three and a half years. I rode it as-is with only new tires for two years before doing a rebuild and adding some upgrades. Apparently I have no complete picture. 75% finished. This past summer my cousin moved back to Belleville at the same time I did and had discovered biking in university. He dove into it with the gusto that only he can and introduced me to some new concepts. He was interested in much longer rides where I had really only been riding around town. In addition I had become interested in a few other styles of bike. I had the urge to build a race version of my Superbe. I wanted to take an old ten-speed frame and wheels, lace in an internal gear hub, invert the north-road bars, and see how that went. At the same time I had also become interested in the fixed-gear culture. The problem was I didn't want to experiment on my beloved Superbe. I decided to pick up an old ten speed and a rough three speed and build a frankenbike maybe. Old ten-speeds proved really difficult to find in Belleville for some reason. The market had been flooded with cheap mountain bikes and the ten-speeds had seemingly vanished. I ended up indiscriminately buying two bike for $30. They both turned out to be not very good. The ten-speed was a brick of an old CCM Targa. The three-speed was an early Japanese bike before they became any quality. I ended up simply scrapping the Targa. It is now a truing stand. The Japanese bike ended up getting rebuilt as a stopgap bike to get my girlfriend to and from the grocery store. It has, however, not weathered well and in the spring I'm going to look out for a nice little mixte or something for her. My second endeavor at a ten-speed was a little better. Finally a Canadian-Built Raleigh from the mid-eighties came up on Kijiji for next to nothing. The model name had been scratched off by the lock and I never could find the serial number, though I could find no evidence of it's removal either. It was in rideable condition and no one would miss it if I experimented on it. It had a nice set of cranks and derailleurs but that was about it. My goal was to try not to put any money into it aside from experimenting. I ended up scoring some cheap toe-clips, replacing the bar tape, a tire, and a brake cable. My plan was to ride it for a bit to see how I liked the ten-speed thing and then build something interesting out of it. It turns out I liked it a lot but couldn't get comfortable on the bike. I loved the clips. I loved the curly bars. I just couldn't get comfortable on the bike without spending money for things like a new stem and seat and both were weird sizes. Even if I did this, it still had steel wheels and bars, and lousy brakes/levers. The bike just wasn't worth it. That's when I found my Fuji S12-S. I've only had it for a few months now but it's the bike I've been looking for. The unnamed Raleigh had helped me to realize I like the idea of a sport-touring bike and I liked the idea of being able to go long distances. 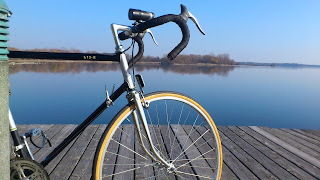 When I had begun looking into upgrading the Raleigh the Fuji came up for less money than the upgrades would cost and it had more quality components than I had considered buying already on it. I got more bike for less than the wheel set I was considering buying. While not an exotic bike it had all good-quality components and a quality frame. Over a month of work where I could squeeze it in I rebuilt it very carefully and it turned out really quite well - nearly brand new. So now I've got three bikes sitting in the garage. The Fuji for longer distance and faster rides. The Superbe for puttering around town in nicer clothing. And the no-name Raleigh waiting to be dealt with. I have a hard time justifying two bikes that do the same thing. Therefore I think the no-name Raleigh needs to go. In addition I think I can get as much out of it in the spring if I sell it as I paid for the Fuji which would be satisfying. I still have the urge to find out if I would like fixed gear riding but I just don't see having time for it. If I were to have three bikes, the third I think would have to be a folding bike to keep in the trunk of my car, throw on the boat, or take the train. So now, as winter sets in and I only have one or two rides left if any at all this is where I stand on my biking history. I'm pretty excited for next summer. Winter can't end quick enough, I may need to invest in a trainer.